The frequency scale above the tuning display is rendered in green for frequencies within PSK sub-bands, and in red for frequencies outside of PSK sub-bands; you can customize the definition of these sub-bands by copying and editing a file. The Receiver panel contains 5 sub-panels, each containing a related group of settings that you can inspect and/or modify. The textbox in this panel allows you to specify the optimal receive offset frequency, in Hz., used by the Optimize Offset function. Values must lie in the range of 50 to 3500. The Transmitter panel contains 5 sub-panels, each containing a related group of settings that you can inspect and/or modify. 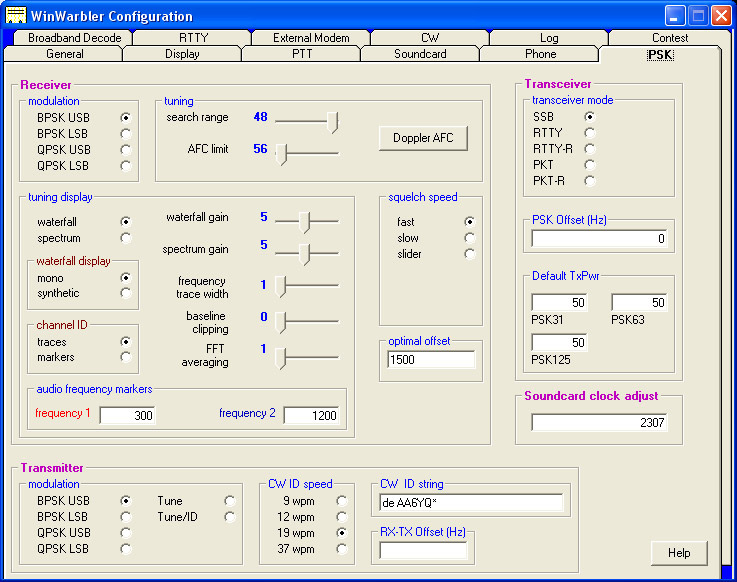 This setting can be used to compensate for a frequency offset between transmitter and receiver. Specify your transmitter's offset in Hz. If your transmitter's frequency is 10hz higher than your receiver's frequency, enter 10; if it's 10 hz lower, enter -10). The Transceiver Mode subpanel enables you to specify the mode to which the transceiver is set (if Commander is running) during PSK operation. The PSK Offset subpanel lets you specify an offset (Hz) that aligns the displayed PSK receive frequency with a known PSK frequency; negative values are accepted. This can be used to compensate for an offset between your transceiver's VFO display and its actual frequency. The Default TxPwr subpanel specifies the default power used to initialize the QSO Info panel's TX Pwr textbox when the Enter or Tab key is struck in the QSL Info panel's call textbox with the Main window's Mode panel set to PSK31, PSK63, or PSK125. The Soundcard clock adjust panel enables you compensate for a soundcard clock frequency that's fast or slow by up to10,000 parts-per-million (PPM); a positive number makes the clock faster, and a negative number makes the clock slower. The free application MMSSTV includes an excellent soundcard calibration mechanism that displays your soundcard's error in PPM; be sure to configure MMSSTV for a clock frequency of 48 khz, which is what WinWarbler's PSK engine uses. To specify your own sub-bands, make a copy of DefaultPSKBands.txt in the Databases folder and name it PSKBands.txt. Edit the frequencies in PSKBands.txt as desired, and save your changes; you can also define sub-bands for the 6M and 2M bands. In the Main window's Mode panel, select a mode other than PSK31, PSK63, or PSK125, and then select PSK31, PSK63, or PSK125. the tuning display's frequency scale will be colored as specified by your custom sub-band definitions.